The Rebel Sweetheart. 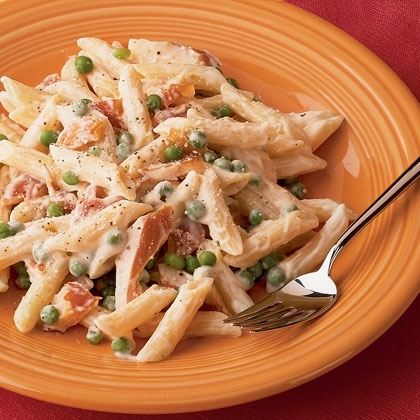 : Foodie Goodie | Penne Alfredo with Smoked Salmon. I'm not the most religious person, but having been born and raised as a Catholic, I've been accustomed to 'no-meat-Fridays' during the Lenten season. In observance of Good Friday, we won't be having meat on the menu. But we do have fish and pasta - because not having meat doesn't exactly mean you can't enjoy good food. 1. Boil the penne according to the directions on the package. In the last minute of boiling, add the peas to the pot. 2. While waiting for the pasta to cook, begin preparing the Alfredo sauce. In a medium pot, bring the butter and cream to a boil and immediately lower the heat so that the mixture gently simmers. 3. Stir the mixture occasionally for about 4 minutes or until it leaves a thick coating on the spoon. 4. Add the grated cheese, salt, and nutmeg. 5. Drain the penne and peas and top it with Alfredo sauce. Serve warm. As seen on Spoonful. Shared with Food Friday and Food Trip Friday. You're right. We still have to eat good food even during the Lenten Season. I love how you photographed this, nakaka-invite. Believe it or not I didn't start making pasta like this until my husband died. A friend gave me a Rachel Ray cookbook and the rest is history. What I like about your recipe is the pinch of nutmeg. I'll have to try that some time. I am not a big fish eater but this dish looks pretty tasty. Thank you for sharing. the rest of the family would probably pass on this one not be fish eaters--BUT I think it looks yummmmmy! Ooh! I hope this is really as creamy as it looks Cjai! Thanks for the easy recipe! perfect not just during Lent but anytime! i honestly haven't tried adding salmon to my pasta (the canned tuna is more readily available), but will give this a go!